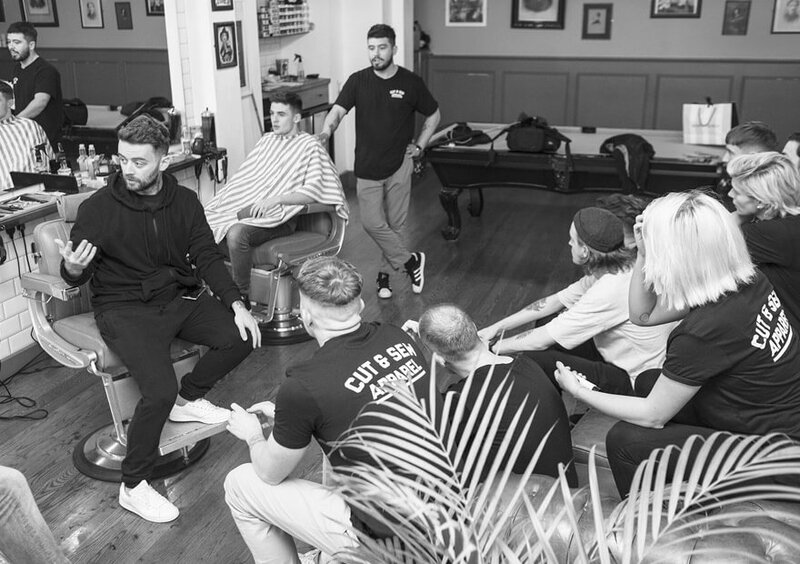 Barbershop culture is on the rise in Dublin. Barbershops are becoming cultural hotspots. Places you can go not only for a haircut, but for music, design or even a whiskey. 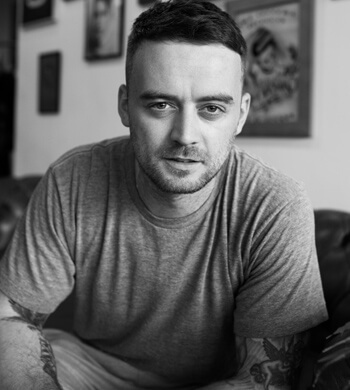 By taking the best of New York’s barbershops and adding a touch of creativity and an Irish welcome, Sean Bryan of Cut & Sew has built his business from one chair in the basement of a record shop to three stores in Dublin’s city centre. And he isn’t finished yet. Dublin.ie caught up with Sean to see what’s behind his success. Sean left school after third year and started a carpentry apprenticeship. It didn’t work out, so he turned his hand to hairdressing. “That sounds a bit mad. From working on a building site to go to hairdressing.” Sean laughs. But, sitting in Blindeye – his latest shop in George’s Street Arcade – which he designed, it’s easy to see how the two have come together. Cut & Sew shops are instantly recognisable. Pared-back, industrial and monochromatic and decorated with a combination of the rediscovered, the salvaged and the modern. Sean qualified in some of the best salons in Dublin, cutting and colouring women’s hair. After a while, he started to build up a male client base. He was sceptical at first, but he soon came to enjoy the “instant gratification” that comes with cutting men’s hair. “Within half an hour a lad could look ten times better”. It was during the recession that Sean started to question what he was doing. “I wasn’t staying anywhere longer than six months. I had no money or no savings… People were getting creative because they had no other choices available. I was chatting to a friend of mine. I said ‘I’d love to do a barbershop’. He said he’d ‘love to do t-shirts’.” And so Cut & Sew was born. It started in the basement of All City Records on Crow Street, Temple Bar. Sean had gotten to know the owner, Olan from buying records and spray paints in his shop. Olan gave him the opportunity he needed. “We didn’t need that much capital. Using the carpentry, I built things from wooden boxes that Olan had lying around. I painted the walls turquoise green got a piece of sh*t chair, the cheapest gown I could get and a back mirror. I think people thought it was meant to look like that, kind of ‘Berlin-y’, like it looks a mess but it’s cool”. It started as a whisper – ‘go down and see this guy Sean in the basement’ – but soon it reached a point where his worse-for-wear chair couldn’t keep up with demand. He moved upstairs to the back of the store, making room for his second chair and hiring his first employee. It had started small. “You couldn’t swing a cat in it, the till was in a cupboard”, says Sean. But all of a sudden, it blew up. With belief in his dream and capital in his pocket he opened his second shop on Wellington Quay and then Blindeye in George’s Street Arcade in 2016. So what’s next for Cut & Sew? “It has grown so much. I want to build on what we have, get the roots strong”. That growth could come in the form of an academy or a new shop, but either way the business will continue to grow.